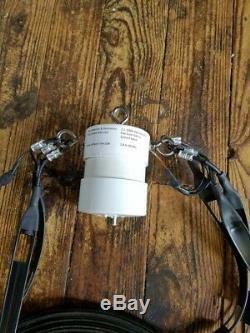 The 3 element fan dipole works very well at covering all the bands 80-6 meters, while using a tuner on the non-resonant bands. This antenna will be custom made for you. HF (1.8-30 mHz) 5-cores FT-240 31 50 ohm input COAX fed. 10KW SSB 7.5 CW RTTY. FLEXI 420 OHM LADDER LINE used for the elements ie. With Flex weave 14 as the tuning stubs. Simply move the dog bone up or down the flex weave to your desired frequency. 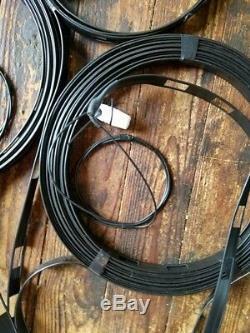 This antenna can be hung either in a Flat-Top or Inverted V configuration. Every connection crimped, soldered and adhesive lined heat shrink covered. 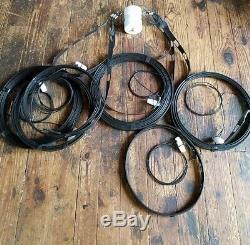 Add your 50 Ohm coaxial feed line, suspension rope and go. 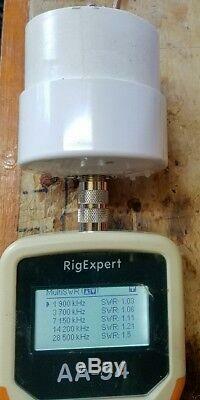 NOTE A wide range tuner can be used to tune this antenna to 80-6 meters. 8040/20 3 band fan LLFW. The item "80/40/20 METER FAN MULTI-BAND ANTENNA DIPOLE 10KW CURRENT BALUN" is in sale since Wednesday, September 13, 2017. This item is in the category "Consumer Electronics\Radio Communication\Antennas\Ham, Amateur Radio Antennas". 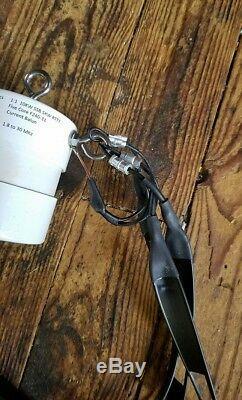 The seller is "ni4l_antennas_electronics" and is located in Taylorsville, North Carolina. This item can be shipped to United States, Canada, United Kingdom, Denmark, Romania, Slovakia, Bulgaria, Czech republic, Finland, Hungary, Latvia, Lithuania, Malta, Estonia, Australia, Greece, Portugal, Cyprus, Slovenia, Japan, China, Sweden, South Korea, Indonesia, Taiwan, South africa, Thailand, Belgium, France, Hong Kong, Ireland, Netherlands, Poland, Spain, Italy, Germany, Austria, Bahamas, Israel, Mexico, New Zealand, Philippines, Singapore, Switzerland, Norway, Saudi arabia, Ukraine, United arab emirates, Qatar, Kuwait, Bahrain, Croatia, Brazil, Chile, Colombia, Costa rica, Panama, Trinidad and tobago, Guatemala, Honduras, Jamaica, Viet nam, Uruguay.